WATERTEC offers a wide range of Industrial Reverse Osmosis Plants best suited for stringent process requirements. Our plants are carefully customized and configured to suit individual requirement of output water, which varies from normal drinking application to the specific usage, such as food processing, pharmaceuticals and boiler feeding requirement. These systems come standard with pre-filters, chemical dosing and antiscalant dosing. Customization is available on all units based on individual water application and customer need. These high-volume reverse osmosis systems are skid mounted and feature an excellent pre-treatment design and premium components to ensure guaranteed quality and performance. They are designed for higher recovery rates and minimum energy consumption, so that you experience greater savings with lower maintenance and operations costs. These ultra high-volume reverse osmosis systems are ideal for heavy duty commercial or industrial applications. Remote Residential Communities, Resorts, Hotels, and Hospitals. Counted as first among the best, we provide the best quality of Commercial RO Systems. Fabricated by using the best quality materials and ultra-modern machinery, these presses are used for solid/liquid separation processes. Less noise, high performance, low maintenance and enhanced functional life make these belt presses highly demanded in various industrial applications. The Commercial RO Systems come in standard models. These systems can be customized to add Multimedia Filters, Activated Carbon Filters, Water Softeners, Antiscalant Dosing Systems, and UV Sterilizers. These systems are used to purify water and remove salts and other impurities. These are also capable of rejecting bacteria. 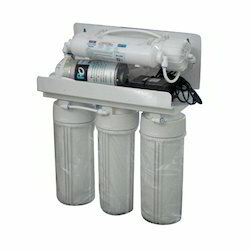 These are our most durable RO systems with great value in quality, convenience, and price. NSF-grade high quality parts are used to build this tough system. The commercial RO systems are constructed with premium components, high quality filters and membranes to guarantee high rejection rates and output speed. Commercial RO water treatment is very complex due to need of very large amounts of daily water processing. There are many stringent requirements for the input water quality for commercial ROs compared to residential RO systems. Commercial RO systems (at over 400 GPD flow rates) would always require pre-treatment of the incoming water to assure a flawless operation and membrane/system longevity. The appropriate pre-treatment depends on local water quality. The most commonly used pre-treatments are water softeners and back-washing carbon filters for treating hard and chlorinated water. Other specialty filters can be used when specific contaminants are present. For example, if you have above 0.5 ppm of iron in your water, you would need an iron-removal filter in front of the commercial RO system. We have invested in highly advanced machinery for rendering our customers with the best quality of Domestic RO Systems. Designed as per pollution control board standards, these systems are easy to operate and are known for their consistent performance. Used in water treatment applications, these systems are available with us in various technical specifications.